Traditional full-service advertising agencies of the Mad Men era are diminishing as today’s marketing agencies become leaner and more agile. A new breed of specialist agencies with expertise in a specific industry or discipline are cropping up. These agencies have deep expertise in one field, as opposed to general expertise across the board. Some that we admire are family marketing experts Steel Branding and toy industry experts Litzky Public Relations. Other specialist agencies focus on a specific discipline such as lead generation, travel PR, digital marketing, influencer marketing or SEO. Break the Ice Media specializes in travel and tourism and we focus on travel PR, digital marketing, content development and strategy. 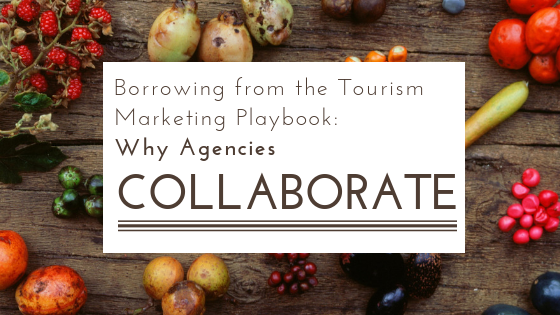 When solutions to our clients’ business issues require disciplines outside of our expertise, we borrow from the tourism marketing playbook and look for ways to collaborate with other agencies to deliver better results. I like to call this co-opetition, where perceived competitors come together, cooperating and creating bigger results than they could achieve on their own. The idea of competing agencies collaborating is not new. Big consumer brands have been pushing their agencies to collaborate for many years. A 2010 article published in AdAge called “Agency Collaboration More Important Than Expertise, Say Marketers,” captures perspectives from leading brand marketers on using multiple agencies. In the article, marketers suggest that agencies who master collaboration will win in the long run. Collaboration is a topic we explore each week on my podcast, Destination on the Left. Destination on the Left focuses on destination marketing in travel and tourism, showcasing the creative collaborative work that is unique to the industry. Whether it is an airline, hotel, and attraction working together to create a travel package or a regional approach to market a tourist destination. I find in marketing circles outside of travel and tourism, the idea of collaborating to leverage resources and expertise is not the norm. Many best practices shared by our podcast guests can be applied to any industry looking to create strong, successful collaborations. Adopt an open-communication approach, clearly and regularly communicating with everyone. Understand roles and responsibilities, hold each other accountable and ask for help when needed. 2. Bringing the right resources to bear. Know when you need to bring in outside help and identify the expertise needed for the project. Make sure that everyone working on the project understands what success looks like for the collaboration and the project. 4. Form relationships that lead to partnerships. Networking is a good way to find, nurture, and get successful collaborative partnerships off the ground. 5. Have a shared vision. It’s important that all collaborators envision the same outcome for the project. Find partners who share your philosophy and approach to work to make the project more efficient and effective. Make sure you have doers on your team who are committed to the timeline. Tap into the collective knowledge of the partnership to find better solutions for your project. 9. Have a can-do attitude. Approach every project with the attitude that it will succeed. Be open and honest about your capabilities, ask for ideas and input when needed and check your ego at the door. The best collaborative agency teams have clearly defined roles. They identify an account lead and work seamlessly together as if they were one agency. As a client, you can expect to receive the benefits of multiple disciplines, deep expertise, and better solutions to your business issues. When we look for agency partners at Break The Ice Media, we look for agencies who we have worked with in the past or who belong to our agency network. They subscribe to a similar philosophy or have deep understanding in the tourism industry and bring a different skill set to the table. We work hard to identify partners on an on-going basis in order to have those partnerships ready when a client need arises. The agency partner we bring to the table for a client engagement is an extension of us and our reputation. We want to be confident in the partners that we bring forward because our ultimate goal is success for our clients.